switchBLADE. was originally created as just a fanlisting way back in 2006 - November 23rd to be specific. Back then I only had what Microsoft Frontpage and some Adobe program had taught me about manual (as in, not using a template) web design. Luckily I've come a long way since the first site was up. I write the coding by myself, and whilst I've taken to using art not drawn by me in the layouts, I like to add a touch of Photoshop to them. If I had to list the 'tools-of-the-trade', I'd say Notepad and Photoshop. That's about all. The name itself was inspired by a song of the same name on the Bakuten Shoot Beyblade soundtrack. 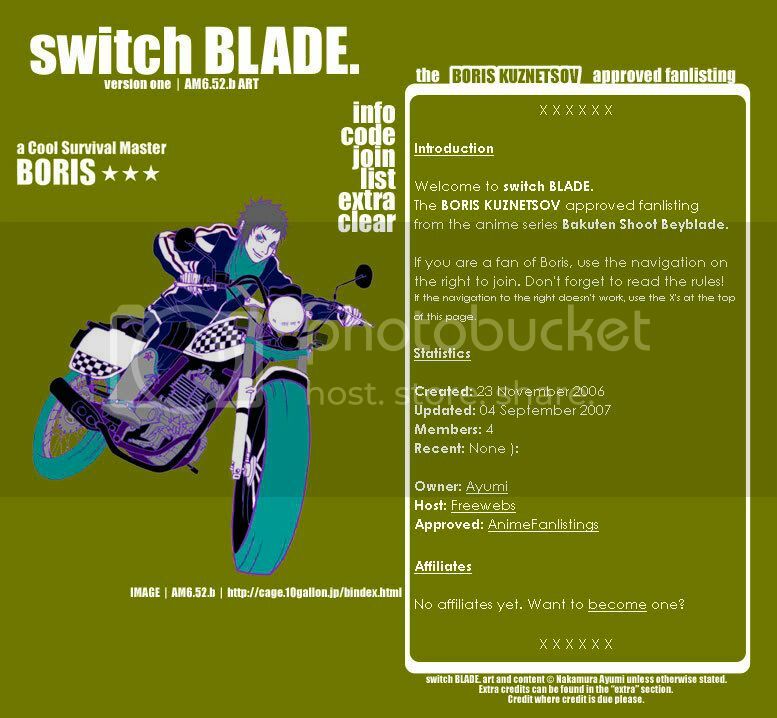 Originally planning to call the site "off the CHAINS", I heard the song "Switchblade" on the internet and think the lyrics, especially the chorus, suit Boris well. For me this is the only game in town. The 'underground' is obviously referring to the Abbey, as from what we see on the show, a lot of it seems to be winding underground corridors. 'Lonely sights/lonely sounds' and 'darkness all around' I think describes Boris' training in the Abbey, although maybe that's just me following the belief that he likely spent a lot of time in some sort of solitary confinement. 'No way up' referring to no means of escape, 'always down' to the way the bladers in the Abbey were always under Borcloff's foot. Finally, 'the only game in town' would be beyblading, and the only thing Boris is able to do after having everything else, emotion included, stolen from him. Woah, that was a bit long-winded. Previously, meaning version one, the site was said to be owned by 'Ayumi'. This is in fact me, from before I changed my email address to the one I have now. 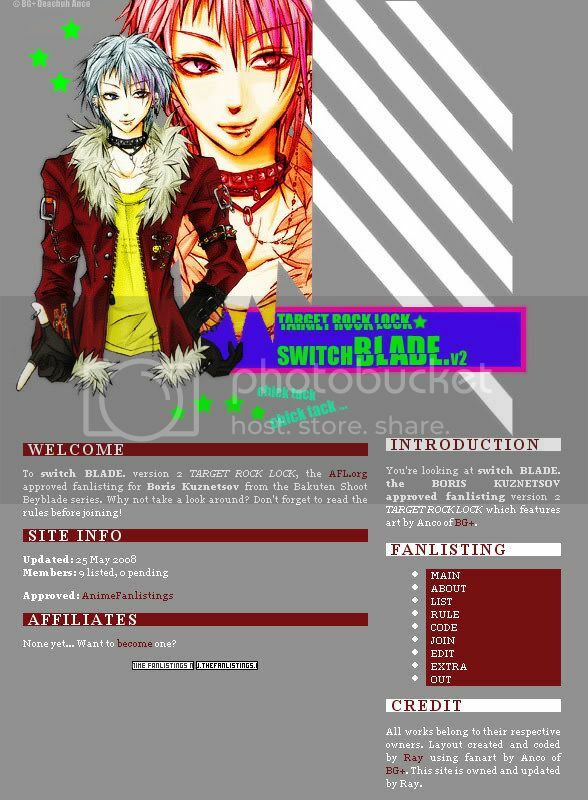 So, Ray is still Ayumi, and Ray still owns the site.